It’s that time, again. 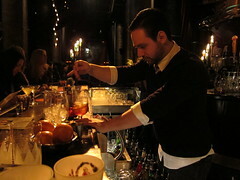 Mixologists – mostly hailingÂ from New York City -Â have flown in to show off their steez at The Edison in Downtown LA tonight. With Joe Brooke now firmly at the helm of The Edison’s cocktail program, there have been a few changes in protocol thatÂ we were made aware of at last night’s media preview. At tonight’s Radio Room, you will only be able to order each cocktail from the visiting mixologist who designed it via drink tickets at designated stations and servers. Edison staff will serve all other cocktails, food and beverages. An added perk on the food side as well: Christophe Happillon, who has for awhile now served oysters on the half-shell during Radio Room, will also have crab claws available! Though most have flown in from the other coast, I enjoyed the cocktails from Seattle’s Zane Harris (of Rob Roy) probably the most. Last night at the media preview, the Globo Rojo #2 made me do a double-take withÂ its smoky strawberry profileÂ at the center. The other cocktail he brought us was the Vieux Cerde, made with 12-year Jameson, VSOP and a “drizzling” of Elisir M.P. Roux and bitters. It was truly a cocktail that made you think – in a good way – with a deep complexity that evolved the longer it lingered on your palate. Following closebyÂ as far asÂ my favorite cocktailsÂ for the night wereÂ byÂ Giuseppe Gonzales – currently at Dutch Kills and working on a new bar called Painkiller on the Lower East Side. The Wild Orchid (gin, almond, elderflower & red wine floater) and Infante (tequila, lime, orgeat, orange blossom water, nutmeg) both come from Dutch Kills and they were both incredibly refreshing in their own way. The red wine floater in the Wild Orchid, which is usually suspended when the drink made with crushed ice, added a bit of weight and color to what might otherwise be a lightweight concoction.Â The Infante, which is Dutch Kills’ most popular cocktail, was like a sophisticated turn at the margarita – perfect with the added citrus of orange blossom and rounding out with a nutty finish from the freshly-grated nutmeg. Beautiful. Don Lee, of Momofuku Ssam Bar fame, put together his Rite of Spring – which was a “fresh, seasonal take” on a classic Gibson. The base was vodka and also had rice vinegar, but with such a strong onion infusion in the cocktail, I thought gin might have blended better. Korean peppers further added complexity but I had a hard time with this particular vodka cocktail. Simon Ford (Pernod Ricard -Â New York & London), served up a cocktail named Good Morning, Vietnam, which featured gin, ginger and orange marmelade. I think by this time during the night (with yet another stop at First & Hope to come) my palate had gotten tired – as Maya swore she tasted the ginger, and I had tasted absolutely none. I tasted more lemon than anything, but it was still a welcome introduction to the Los Angeles spring to come. 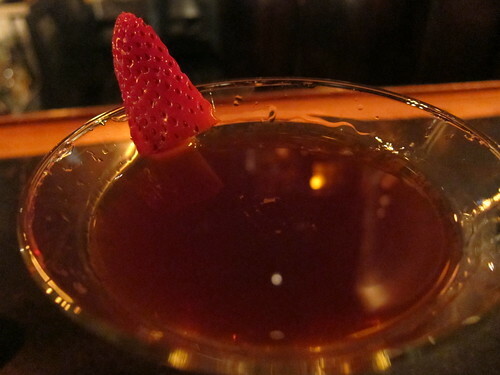 Another bit of news: The Edison will have a new location in Manhattan in about 18 months. Now cocktail aficianados onÂ the other coast won’t have to travel 3,000 miles to get their own dosage. 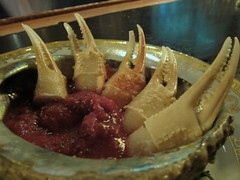 This entry was posted in cocktails, Downtown LA, Events and tagged Christophe Happillon, crab claws, Don Lee, Downtown LA, Dutch Kills, Giuseppe Gonzales, L.A., los angeles, Lower East Side, Momofuku, New York City, oysters, Painkiller, Radio Room, Rob Roy, Seattle, Simon Ford, Ssam Bar, The Edison, Zane Harris. Bookmark the permalink.